3 4 Reasons to Buy A Professional Faucet! 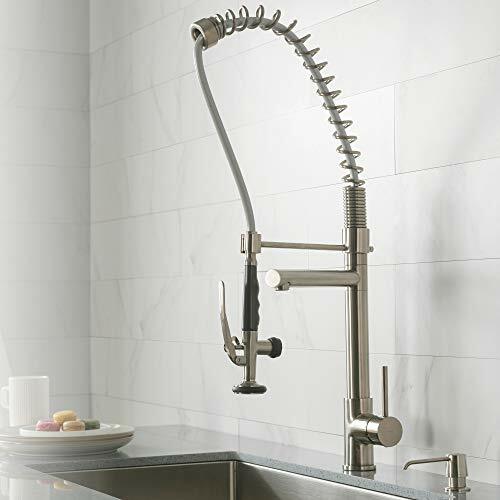 Whether you’re planning on installing a professional kitchen faucet in your home or you’re thinking about buying one for your small business, something is certain. 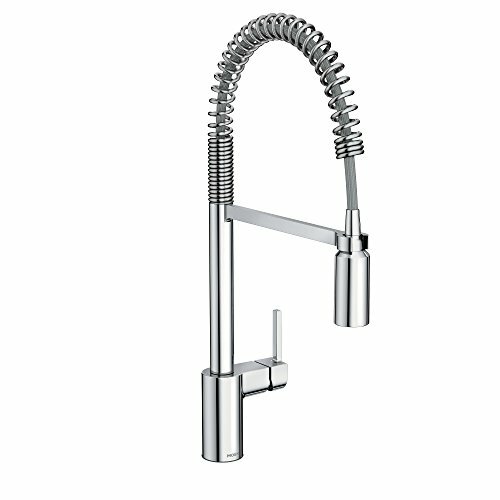 Industrial faucet models look better than regular ones. They are tall, slim, and they have a minimalist design that makes them perfect for modern kitchen designs. But did you know that commercial faucets are also more durable than regular models? 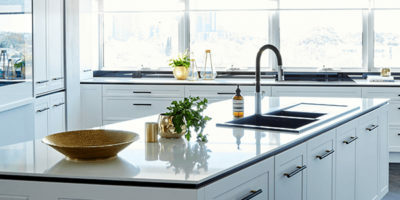 In the following article, we present the commercial kitchen faucet reviews of 2019, and we reveal their pros and cons. Read our short buying guide to see why you should buy one of these faucets, and how they can benefit you in the kitchen. These faucets come with a lot of features, so read the guide to make sure you buy the best professional kitchen faucet for your home. When you cook for a lot of people frequently, you know that the cooking is most often not a problem, but cleaning up can be. When you cook, you take pleasure in what you’re doing. The same thing can’t be said when you start cleaning all the pots and dishes you used. That’s why it’s important to find a faucet that’s capable of removing most of the stains fast. With 2 different spray patterns and a reach longer than the ones provided by different models, the Moen Align will remove most stains without any problems. The faucet has a 10-inch spout reach when it’s docked, and the neck is 22.5 inches long. This not only makes the faucet functional, but it makes it look great when it’s docked as well. Easy Installation – This model comes with Moen’s Duralock easy installation feature. The faucet comes with a streamlined hose design which allows you to connect it faster to your home’s plumbing. Base Plate Not Included – The faucet does not come with a base plate. If you want one, you will have to pay extra. 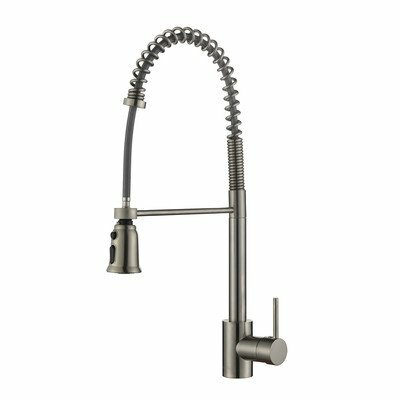 Whether you’re the owner of a small restaurant or you frequently cook for a lot of people, you can definitely appreciate a high-quality kitchen faucet. 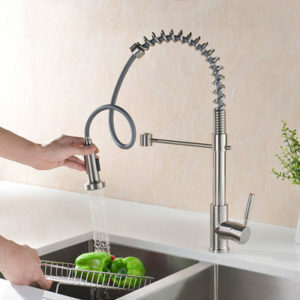 Top notch faucets help you clean the dishes faster, and they’re also very easy to clean and maintain. 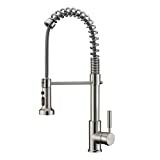 The Hansgrohe Axor Starck is a semi-pro faucet that’s made out of solid brass for increased durability. The faucet is suitable for 1-hole sinks, and it produces water in 2 spray patterns. 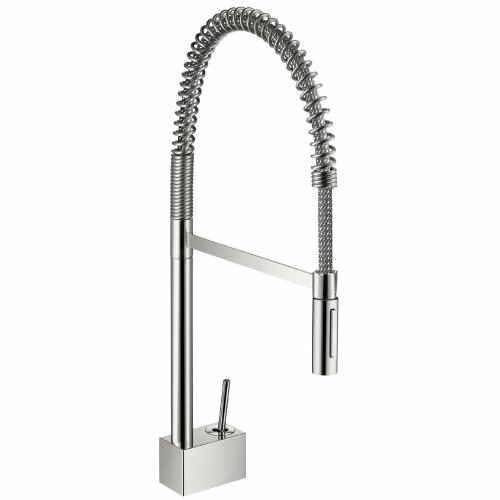 This faucet has a minimalist design that will fit well in both traditional and modern kitchens. The spout arm is capable of swiveling a full 360-degrees for an increased functionality and efficiency. Thin Needle Spray – The faucet produces a very thin needle spray. This spray is very powerful and it’s efficient at removing tough stains. No Base Plate – Unlike other semi-pro faucets, this model doesn’t come with a base plate. This can be a downside if you own a three-holed sink because you won’t be able to cover the ones you don’t use. If you’re looking for a top-notch semi-pro faucet that doesn’t only look good but is very efficient as well, you should take a closer look at this Blanco Culina model. This faucet is so well-designed, it actually won the 2011 Red Dot Design Award. Besides looking very nice, this is a highly efficient model. The faucet’s handle is placed on its side, so you will have no problems installing it close to a wall or going for a backsplash installation. The spout is made out of a flexible steel spring, so it’s very easy to use. You can pull it down with ease, and the magnetic spray head will always find its own way back to the docking station without help. Small Footprint – This faucet has a small footprint, so you will be able to install it on narrower sinks as well as large ones. This is an advantage, as it gives you plenty of room to handle the dishes. Looks Great – The faucet is simply stunning. If you’re looking for a model capable of improving your kitchen’s design, this is it. Coating Peels Off – Some customers complained that the chrome coating started to peel off some time after they installed the faucet. However, this aspect is covered by the warranty, and the manufacturer will change the product with a new one. 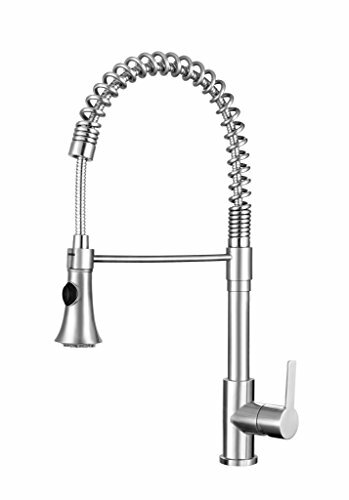 With a simple yet elegant design, the Franke Bern semi-pro faucet is bound to amaze you and your guests. This is one of the faucets that will turn the heads of everyone who wanders in your kitchen, and it will soon become the room’s centerpiece. The faucet is not only great-looking, it’s very efficient as well. This model uses a 360-degree spout and a flexible hose for easy handling. The side lever handle has a 10 – 90-degree movement, and because it’s placed on the side you can install the faucet close to a wall. 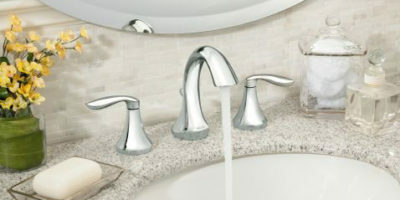 This faucet is suitable for both 1-hole and 3-hole sinks, so you can install it on every sink available on the market. Easy Installation – This faucet benefits from Franke’s quick install feature. This feature will allow you to install the unit by yourself with only a few tools. Large Plate – The faucet comes with a 10-inch plate. The plate is large enough to cover the side holes of the sink if you want a single hole installation. 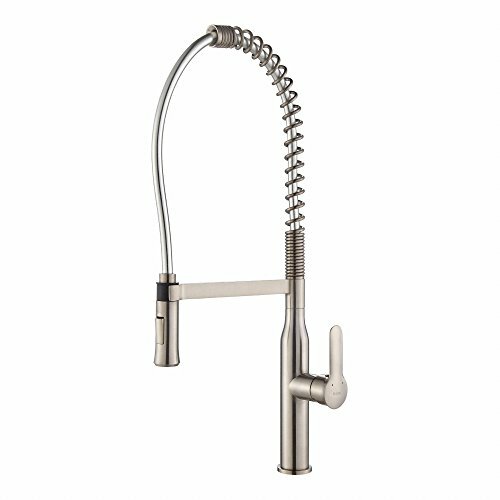 Wide Needle Spray – With a maximum flow rate of 1.75 GPM and a slightly wide needle spray, this faucet will make you use some elbow grease every time you try removing tough stains. When you’re renovating your kitchen you have to take into account finding good looking appliances and fixtures, not only functional ones. And when it comes to good-looking fixtures, there are few semi-pro faucets that can compare with the Kraus KPF. This faucet has a minimal design that’s meant to help you in the kitchen. The pull-down spray head features rubber nozzles that will prevent any limescale and hard water deposits. A lever in the spray head’s handle diverts the water to a second arm you can use to rinse or fill pots. The faucet is easy to install, and it’s suitable for all single-hole sinks on the market. Heavy-Duty Design – This faucet has a heavy-duty design, and it’s built to last. The finishes are rust-resistant, and the brass construction is very durable. Two Water Sources – The faucet can use both a pull-down sprayer and a small pot filler. You can choose which one to use at all times and switch between them with ease. Slow Water Flow – The faucet has a slow water flow, so you will encounter some problems if you want to use the spray head to remove tough stains. 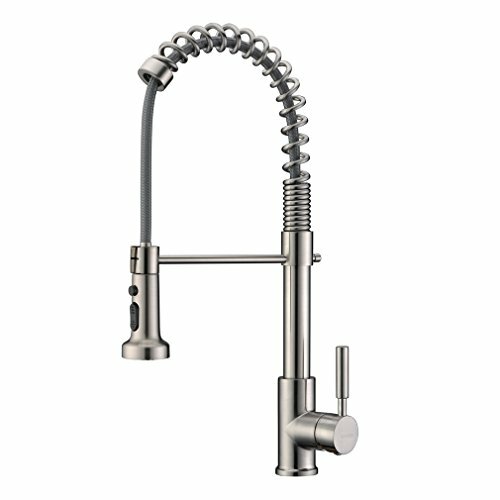 Spout Reach	: 8 27/32"
Whether you’re a small restaurant owner or you just like the way commercial faucets look, you’ll take a closer look at the semi-pro model produced by Zuhne. This unit does not only look good, but it comes with a lot of features that will help you in the kitchen. The faucet is entirely made out of food-grade stainless steel, so it’s resistant to rust and easy to maintain. The satin finish looks great, but it’s also very resistant to scratch and staining, so you won’t have to clean the faucet too often. This faucet uses ceramic cartridges that ensure a drip-free performance for years on end. With a topwater flow rate of 2.2 GPM, you will be able to use the faucet to remove stubborn stains without any problems. Good Aerator – This faucet uses a good aerator, so there won’t be any wild splashes when you use it, even though the spout is pretty tall. Tall – The faucet is 27-inch tall, so you won’t have any problems cleaning pots and pans even if you don’t like using the pull-down spray head. Spray Head Can Fall – Some customers complained that the spray head can fall if it’s not docked properly. Make sure it is after you finish using it. When you’re remodeling your kitchen, you have to make sure you buy appliances and fixtures that will stay in fashion for a long time, unless you plan on remodeling it again soon. If you want to make sure you’ll buy a nice semi-pro faucet, you should look at the Kraus Nola. This single lever faucet is made completely out of metal for an increased durability. The stainless steel and chromed finishes are both top-notch, and they won’t show every water spot and fingerprint, so you will be able to clean them with ease. 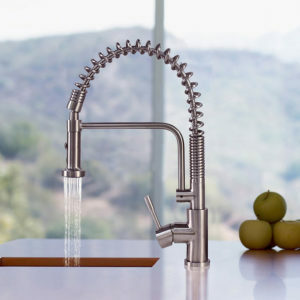 The faucet uses a neoperl aerator that’s easy to clean and reduces the water waste without lowering the water pressure. The spray head has a magnetic docking feature, and it will automatically return to the dock when you finish using it. Rubber Nozzle – The faucet’s spray head has a rubber nozzle. The nozzle is very easy to clean and prevents build-ups. With a minimal design and a nice looking finish, the Geyser commercial style faucet would make a great addition to most modern kitchens, no matter their design. The faucet comes with a precision ceramic cartridge that will last for a very long time, so you don’t have to worry about dripping. The smooth finish will not reveal the water spots on its surface, so the faucet will look as good as new even though you won’t spend a lot of time cleaning it. 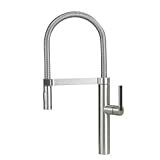 This faucet comes with the fittings you will need to install it, and they are very good. The faucet is easy to install, and you will be able to do it yourself if you have some experience with DIY projects and you’re patient. Easy Installation – This faucet is easy to install and most people will be able to install it themselves without encountering any problems if they have some previous plumbing experience. Durable – The faucet is heavy and sturdy. If you take care of it over the years, you will be able to use this unit for a very long time. Bad Instructions Manual – Even though this faucet is pretty easy to install, the instructions manual is not helpful. Whether you’re looking for a good commercial style faucet for your small business or your home, you should take a closer look at the model produced by Ruvati. This faucet has a solid brass construction for increased durability, and the high-quality finish makes it rust-resistant. The finish is easy to clean, and it will resist the daily wear and tear without scratching its surface. The faucet comes with a pull-down spray head that’s capable of producing two types of sprays. Unlike other commercial-style faucets, this model uses a system that doesn’t require you to keep the knob pushed when you want to switch between the sprays. When you press the button once, the needle spray mode will be on. If you push it again, it will go back to the spray mode. As easy as that. Good Price – Commercial style faucets are usually expensive. Unlike other models, this one is decently priced. Spray-Lock Feature – This faucet can lock the spray pattern currently in use. This is an advantage because you don’t have to keep your hand on the sprayer when you’re using it. Splashes – Remember to turn the water down when you switch between the spray patterns. Otherwise, you can end up splashing water. If you’re looking for a high-quality commercial style faucet, the one produced by GICASA seems like a safe bet. This faucet is one of the best-selling models available on the market, and it’s also one of the highest rated ones. One of the advantages of choosing this faucet is that it comes at a great price. Usually, commercial-style faucets are expensive, but this is not the case. In fact, this faucet is cheaper than other models which are not even designed in the same style. The faucet has a solid brass construction which increases its durability and uses ceramic disc valves to operate without dripping water for a very long time. Nice Finishes – The faucet comes in two finishes, and both of them look great. If you want to impress your guests, the oil-rubbed bronze finish will surely do the job. Good Water Pressure – This faucet is capable of producing a good water pressure, so you will be able to use the sprayer to remove most of the tough stains without problems. Bad Installation Instructions – The installation instructions provided by the manufacturer are unclear and difficult to follow. Whether you’re looking for a commercial faucet for your small business, or you just like the way they look and operate and want one for your home, finding the right one might not be as easy as you would think. To help you find the right semi-pro faucet for your home or business, we developed this short guide. In the following section, we will tell you which features you should look for in a model, and how to determine which is the best commercial faucet for you. There are a lot of features you should be aware of when you buy an industrial faucet. Here is how to determine which model is the best one for you. Unlike other faucet types, commercial faucets are tall. This is a great feature because it makes the faucet look better, but it might be a problem if you plan on installing the faucet under a kitchen counter. You have to make sure the space between the top and bottom counters is large enough to fit the faucet and leave you some room to move around it. Another problem might appear because of the height. If you choose a very tall faucet and install it on a shallow sink, there might be a change of it splashing the water on the counter and on the floor. All faucets come with water pressure recommendations, and commercial style ones make no exceptions. If you want to make sure you choose the right model for your kitchen, you have to check the recommended water pressure. If you know your local water source does not provide enough water pressure, you should not buy the faucet. Installing a commercial faucet when it doesn’t have enough water pressure to work properly will make it perform badly. The spray head won’t have enough power to remove difficult stains, and you will have a hard time using the faucet to clean a lot of dishes. When you decide on a semi-pro faucet model, you have to make sure it comes in the right finish. Choosing the right finish can be done in two ways. If you’re only replacing the faucet in your kitchen, you should make sure the new faucet comes in the same finish as your other fixtures and appliances you have in the kitchen. This can vary from kitchen to kitchen, but most people go for stainless steel and chromed finishes. If you’re remodeling your kitchen and you want the faucet to be its centerpiece, you can choose a certain finish for the faucet and only then buy other appliances and fixtures to match the one you picked. This is a great way to make sure everything will have the same finish from the start, and it will impress your guests more. When you’re deciding on a model, make sure you look for one that comes with an extended warranty period. Industrial faucets usually come with long warranty periods, but you should pick the model that comes with the longest one. These faucets are durable and usually last for a very long time, but why should you take the risk and buy one with a short warranty period? As a rule of thumb, the longer the warranty period, the higher the manufacturer’s trust in the product. That’s why better products usually have longer warranties, to begin with. 4 Reasons to Buy A Professional Faucet! You might be wondering why people choose commercial faucets over other models. Well, we can’t give you a definitive answer, but here are what most people think of them. Professional faucets look great. They are tall, they have a swan neck or a clean U neck, and they have a simple yet eye-catching design. Most customers agree that a semi-pro faucet can improve the overall aspect of your kitchen. These faucets are big, so they will attract attention. If you choose to install them on a central island, they will become the centerpiece of your kitchen. If you decide on installing them in a corner of the kitchen, you can be sure they will attract attention towards that corner. You can use this to your advantage if you want to emphasize a certain aspect of your kitchen. If you’re one of the people who frequently cooks, you know that the only thing harder than cooking a meal is cleaning up after you eat it. Well, this is where the semi-pro faucets excel. Not only will they help you with the cleaning up, but they will make it so easy you will be cursing yourself for a fool because you didn’t use one before commercial faucets are powerful, so they will provide enough water and pressure to remove even the toughest stains. They have pull-down spray heads, so you will be able to use them with ease when you have to clean up pots, pans, and trays. They also provide two types of spray patterns. One of them you can use for everyday use, while the other is more powerful and you can use it when a dish is difficult to clean. Most of these faucets are easy to install and use. They come with a single tap for an easier way to set the water’s temperature, and most of them have features that help you during the installation. This is one of the best things about commercial-style faucets. Not only are they covered by a limited lifetime warranty, but they also come with an extended full warranty period. Most of these models come with a 5-year warranty, but some of them come with even longer ones. There are many benefits of using a pre-rinse kitchen faucet. Here are some of the most important ones. Pre-rinse faucets are great for cleaning large pots and dishes. You can use the pull-down spray head to thoroughly rinse the pots before you start washing them, and you can place them on the counter while doing so. The faucet’s hose usually has a very long reach, and that will allow you to clean the pots or let them soak without having to remove all the other dishes in the sink. A commercial faucet can also be used to fill pots, pans, and trays. You can just pull down the spray head and fill them without having to remove all the dishes stored in the sink. 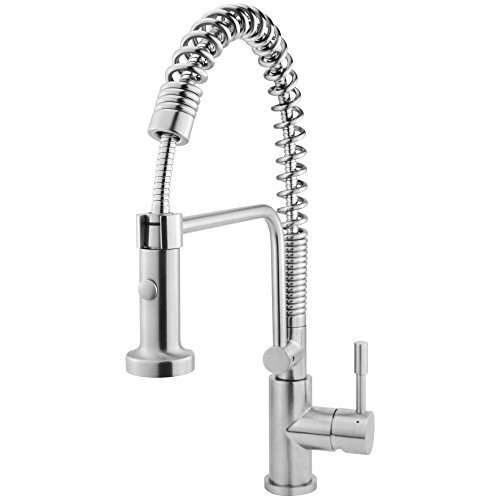 These faucets are specially designed to withstand the wear and tear of a professional kitchen. This means they are not going to get scratched easily, and you won’t have problems with leaks or drips. Industrial faucets are easy to clean and maintain. Unlike other faucet models, these ones usually have rubberized spray heads which will lower the chances of developing hard water buildups. Besides keeping the hard water buildups in tow, these models are also very good at hiding the water spots and fingertip stains on their surface. Most of them have high-quality finishes that will look as good as new for a long time, even though they’re not cleaned very often. Industrial faucets come with two spray patterns. These patterns are good at different tasks. The first one resembles the one produced by a normal faucet, and it’s suitable for everyday use. The second one is narrower and more powerful, and it’s better suited for removing tougher stains. Using these patterns will allow you to wash every type of dish quickly, no matter how dirty and stained it is. No matter how helpful commercial faucets might be, people wouldn’t buy them unless they liked how they looked. And the fact is, these faucets look great. They are better looking than most other models available on the market, and installing one in your kitchen will improve its design. These faucets are also modern looking, so they are a sure investment if you’re planning on remodeling your kitchen. They look modern, and they will keep looking modern for a long time. Installing one in your kitchen is a safe way to make sure you’re not going to need a new one after 5 – 6 years because these units will still be fashionable even then. Visit our top-rated kitchen sink reviews and touchless kitchen faucet posts to see which we think is the very best. 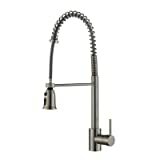 $$ 8.8 x 1.8 x 26.2 inches Brass, metal Deck Mounted 1.8 GPM 8 27/32"
Now that you’ve read our short guide and professional kitchen faucet reviews, we’re sure you can find the right model for your home or business. Industrial faucets are not only better looking than other faucets, they’re also more effective and more durable. 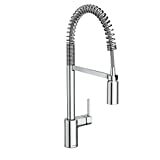 The best commercial kitchen faucet will help you clean the dishes and pots quickly, and they will also help you do a thorough job. No matter how efficient these kitchen faucets are, people wouldn’t be buying them if they wouldn’t look good. Thankfully, these models also look better than other types of faucets. As a matter of fact, installing a commercial faucet in your kitchen will probably impress all of your guests, and it will improve your kitchen’s design and aspect.